Even though we were in the teeth of a biting North wind, it was easy to be wistful about leaving Wistman's Wood. 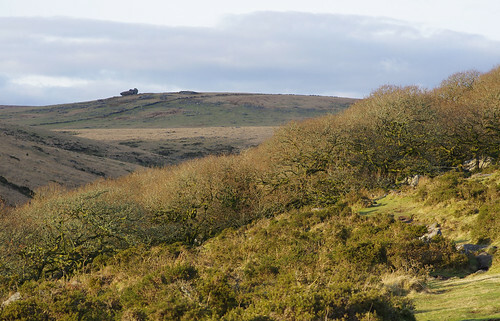 The granite outcrop in the distance in the image above is Crow Tor. On a milder day, with more available daylight we might have gone further and looped round Crow Tor on the way back. But alas it was not to be. It was important to make the best of the time remaining; by recording as many new species as possible. 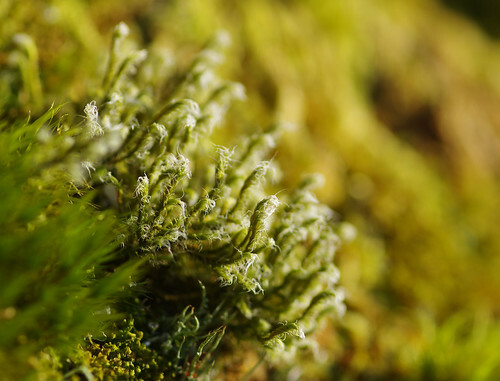 The fringe mosses (Racomitriums) can be notoriously tricky to separate. I have opted for the woolly variety because it is the most common upland species. The hair points of this species are coarsely toothed but unfortunately you need X-ray vision (or a hand lens for us mere mortals) to observe the teeth properly. 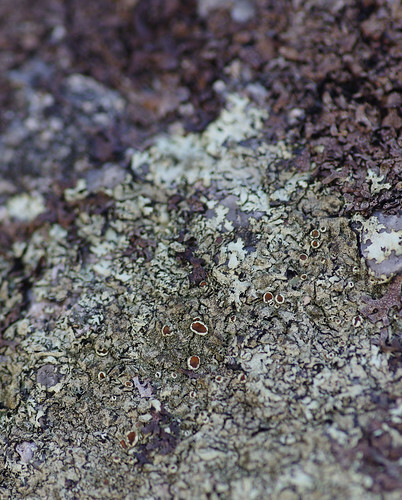 There are also minute Cladonia lichens at the bottom of this image. This is the distinctive 'string-of-sausages' cross section. Sherry tried many times to get a clear shot from corner to corner. 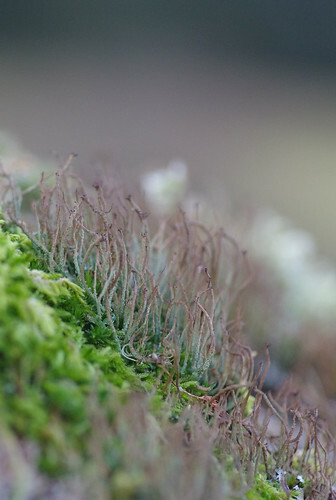 These lichens were on mossy branches, high up above her head. With the added breeze, getting a clear shot was challenging to say the least. Eventually we gave up and left the trees behind. But heading out along the path there were many things to observe on the granite boulders. 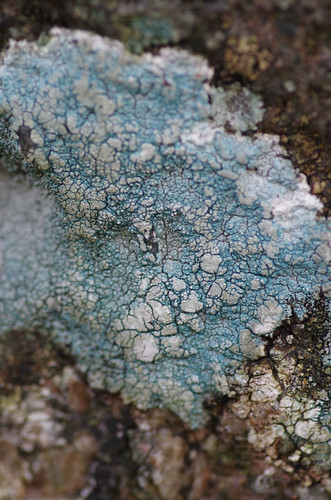 This crustose lichen looks granular from a distance. When the image is magnified, the surface is comprised of warts without holes. Perhaps this is a relatively young specimen which has not yet developed holes. 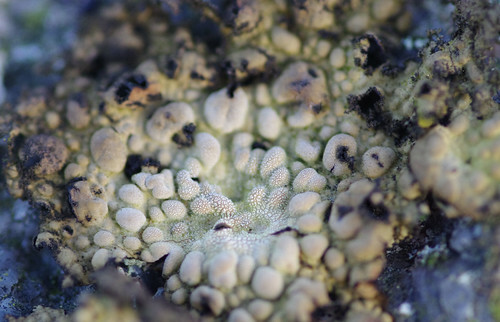 The image above shows a much older specimen of Parmelia saxatilis. The tangle of lobes look faded and many are covered in granular isidia. 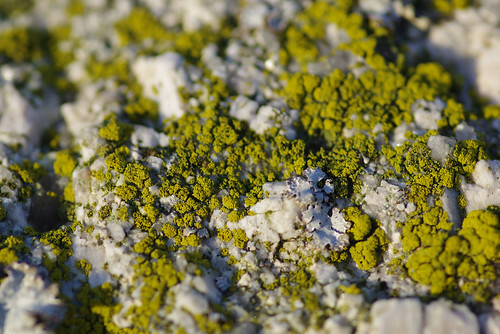 Lichens grow very slowly on rocks. In these relatively untouched places, is it possible they have been alive for centuries - even millenia? This was only a few centimetres across and we might have easily missed it. 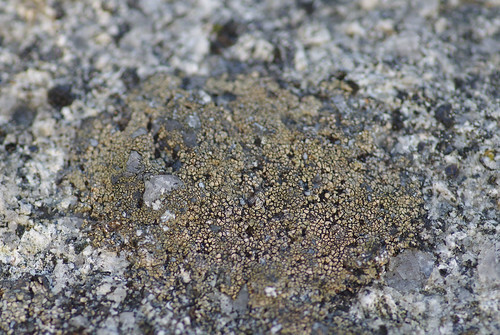 I've noticed that often lichens do not grow on quartz but seem to expand around it. Whatever minerals there are in siliceous rocks like granite, they do not exist in quartz. Speaking of quartz, it was liberally present in many of the granite boulders, including the one where we sat to have our lunch. It was only when I got up that I noticed the boulder would literally sparkle in the right light, another detail that enhanced the magical sense of mystery of Wistman's Wood. 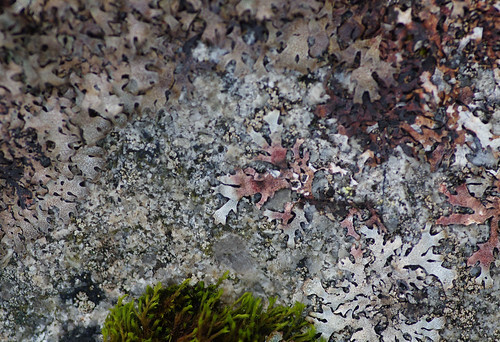 Minerals in the rock have probably enriched this lichen, thereby turning parts of it red. The same species on a different rock. 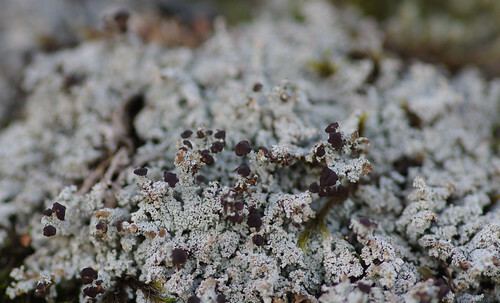 The black rhizines underneath the lobes are simple in form and found to the margins. The rounded discs look a bit weatherbeaten. 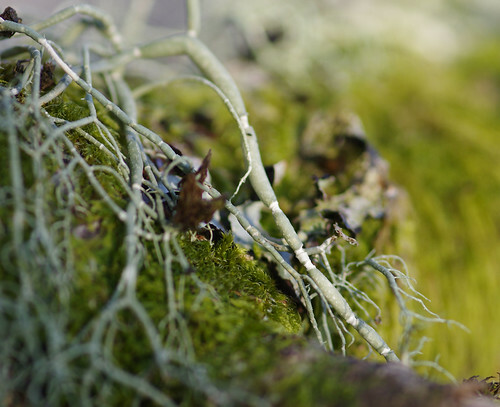 Everywhere we looked, lichens were tangled with hairs. 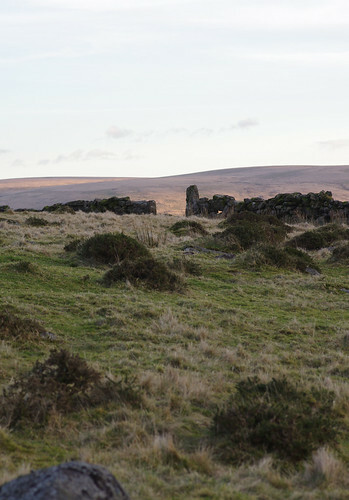 Perhaps grazing Dartmoor ponies or sheep had examined them and left their calling card. I looked at the tips of these and immediately jumped to the wrong conclusion. 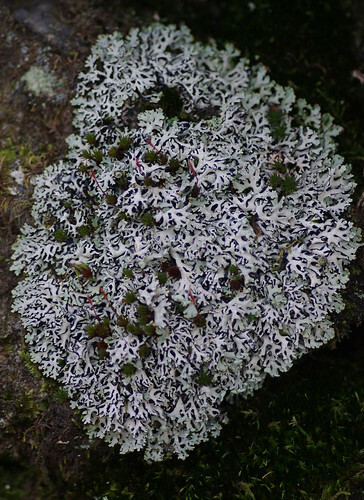 On closer inspection they were not Cladonias at all but belonged to a different group of lichens. 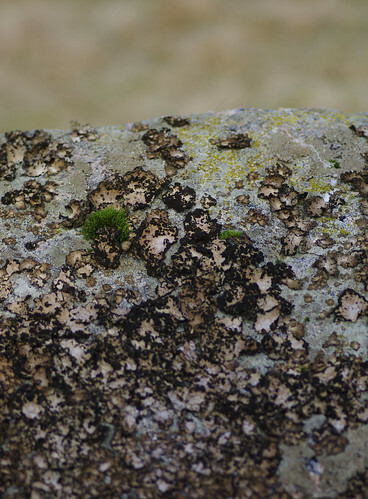 The quartz is being avoided again as this lichen makes its home in the gaps and depressions. We were racing against time at this point; conscious that the last hour of daylight was upon us. 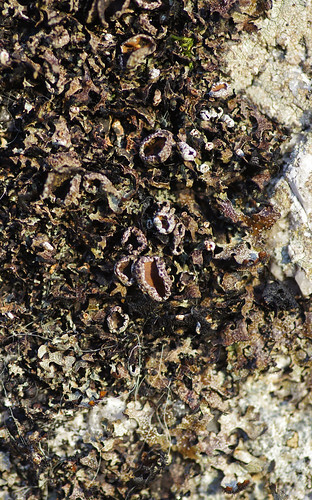 Sherry captured this messy tangle of overlapping Parmelia omphalodes lobes. But there was one thing I was determined to see. I have been keenly keeping an eye open for Rock Tripe during our last few moorland encounters. And we found it at last! 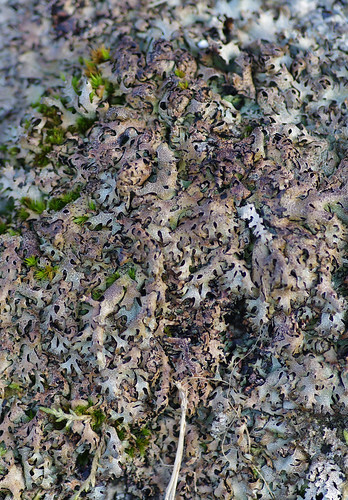 This is one of the archetypal moorland lichens. It is also edible (presumably after boiling) but I didn't think it looked particularly appetising. And sure enough (as is so often the case when you search for something) once we found it once, we seemed to find it everywhere. 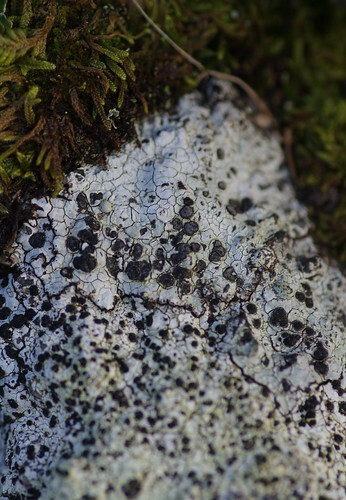 The thallus here is cracked, with a clearly visible black border (prothallus). There are clustered soredia around the upturned margins and some scattered over the surface. I thought this had such a distinctive colour (the like of which we had never seen before) that we were bound to find a match. Expectations have been confounded again but I will keep looking! I had a madcap theory that if I dashed off the main path for a bit I would be able to find a few new things. By going higher up, where fewer visitors venture, the real treasures might be found. It was bitterly cold but I found a rock to examine and entered an unknowable world. But the camera was battling bravely against the light. 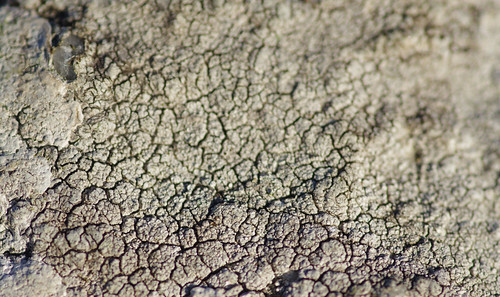 There were gorse bushes with crust fungi on the main stem, destined to be rendered blurry. Sherry took one last look at the dry stone wall, we had examined on the way out. A family hurtled past us, obviously racing to get to the wood and back before the setting of the sun. I could not really see why Sherry was photographing the same things she had done on the outward journey. Of course, as it turned out, these were not the same Cladonias at all but a different species. This was the last 'keeper' of the day. By the time we reached the small car park the light was fading. With freezing fingers I fumbled with my boot laces, and then lost my balance trying to get out of my waterproof trousers. But it had been worth it. Wistman's Wood is the type of place you could revisit again and again and not really notice time passing. And the route, both there and back again had proved almost as rewarding. Our thanks go to Jane Redman for joining us on our quest.